Cheese is a food made from the milk of cows, goats and other animals and, like the milk, the finished product is usually white. Certain grazing conditions will result in tints to an animal's milk, as will ingredients added to change the flavor of the cheese, though most non-white cheese is simply dyed. There are, therefore, a wide variety of white cheeses on the market today with different flavors, textures and uses. Feta is a soft, wet cheese with a rough surface and a bright white color. It is often stored in brine, contributing to its moistness and imparting a salty flavor to the cheese. 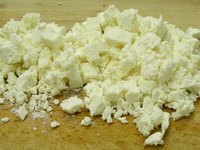 Feta is made by curdling milk by adding either rennet or microbial rennet, and allowing the mixture to separate and drain. The curds are then cut, salted and pressed and the larger mass is placed in a brine solution to cure. Feta cheese is often used in Greek salads along with lettuce, tomato, cucumbers, olive oil and fresh basil. Mozzarella is a semi-soft cheese with a mild flavor. Originally, mozzarella cheese was only made from water buffalo milk, and is still available in some specialty shops. Most modern mozzarella is made from partly skimmed or skimmed cow's milk. During processing, the curds of this cheese are dipped into hot whey and then stretched and kneaded, giving this cheese a stringy, elastic texture. Fresh mozzarella made from whole milk is also available. Named after the name and hometown of its creator, Jack cheese, also called Monterey Jack cheese, is a semi-soft cheese with a buttery-ivory color. Fresh Jack cheese is made from whole or skimmed milk and aged for only one week before used in sandwiches or cooked dishes where its high moisture content and freshness contribute to its ability to melt beautifully. Aged Jack becomes harder with a sharp, rich flavor and is used as a grating cheese. Gruyere is a traditional cheese from Switzerland that is made from cow's milk and allowed to age. This variety of cheese has a nutty, slightly sweet taste that is excellent for fondues, and pairs well with Champagne or Zinfandel. Ricotta is a white, moist cheese with a slightly sweet flavor that is usually made from the whey drained off during the making of mozzarella or provolone cheeses and is, technically speaking, a cheese by-product. The word “ricotta” is derived from the Latin “recocta,” which means “cooked twice.” Good ricotta cheese is firm, but not solid and is used in Italian cooking. It pairs well with almonds, garlic, nutmeg, spinach, tomatoes and vanilla. Parmesan is a hard, dry, straw-colored cheese with a sharp flavor that was traditionally made in Italy. Made from skimmed cow's milk, it is often aged for two to four years. Padano and Reggiano are two varieties of Parmesan cheese named after the regions of Italy in which they are made. Padano is a slightly sweeter variety, and Reggiano has a stronger flavor. Parmesan is available to purchase pre-ground, but the flavor is better when it is purchased whole and ground just before eating. Cheese Underground: Why is Wisconsin Cheddar Orange?